The State has established and nurtured a shared commitment among federal, State, local, and tribal governments and the private sector in its efforts to strengthen the preparedness of the State. With such a commitment, Alaska will continue to develop and improve capabilities to deter, prevent, protect against, respond to, and recover from terrorist attacks, major disasters, and other emergencies. The results of the State’s ongoing assessments provide insight into the requirements of the State. This strategy continues to address the four Strategic Goals and reflect the eight National Priorities, and ensure a broad range of threats and hazards are endemic to the State’s planning approach. The State of Alaska will apply resources available from the U.S. Department of Homeland Security (DHS) through the National Preparedness Directorate (NPD) to address unique planning, equipment, training, and exercise needs to build an enhanced and sustainable capacity to prevent, mitigate the effects of, respond to, and recover from natural disasters or threats of terrorism. Additionally, the State will apply multiple resources available from other federal fund sources, the State’s general fund, and other State agencies by utilizing interagency funds to address these issues. Through existing and emerging partnerships, the State’s vision provides the highest level of security and domestic preparedness. Alaska will engage federal, State, local, tribal, private, non–governmental partners, and the general public to achieve and sustain risk–based target levels of capability to prevent, protect against, respond to, and recover from major events in order to minimize the impact on lives, property, and the economy. With the vision in mind, the mission for Department of Military and Veterans Affairs (DMVA), Division of Homeland Security and Emergency Management (DHS&EM) is to protect the people, property, and economy of Alaska from all–hazards and threats. The State has further categorized four strategic goals to support the above vision and mission. 1. Identify, analyze, and plan for all–hazards that threaten Alaska. 2. Improve individual, community, and agency readiness for all threats. 3. Provide timely assistance to individuals, communities, and agencies in response to events. 4. Assist individuals, communities, private sector, and agencies in recovering from the effects of disasters. 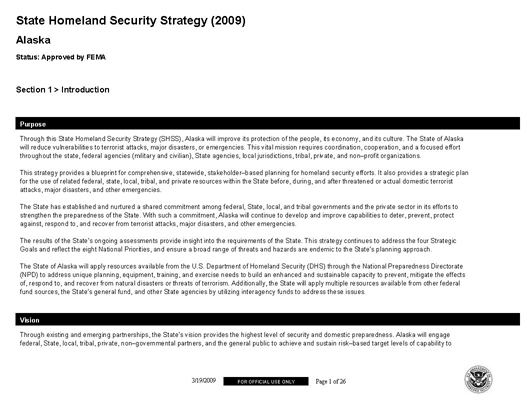 With one exception, DHS&EM is the agency responsible for ensuring the accomplishment of the goals contained in this strategy. The single exception is the Goal “Strengthen Capabilities to Manage Medical Surge and Mass Prophylaxis.” DHSS DPH is the lead agency for the Goal. Evaluation of progress toward achieving goals and objectives will be accomplished by a State–level Senior Advisory Committee. This committee will be composed of representatives from the agencies / organizations listed below. DHS&EM will provide a chairperson for the committee. • DHS&EM reports quarterly on major accomplishments and these reports are then used to develop quarterly narratives for performance measures. • DHS&EM and DPH reports quarterly on performance measures through the State’s Automated Budget System. • DHS&EM and DPH report annually on significant accomplishments through the State’s Automated Budget System. • DHS&EM reports annually on measurement against the DMVA Strategic Plan available in hard copy. • Above reports are available to Senior Advisory Committee for review biannually. • DHS&EM project managers receive quarterly reports for sub–grants with financial and project narrative accomplishment reports tied to the identified objective. • DHS&EM project managers capture reporting information into the State grant database built to track and report various facets of these grants. • DHS&EM project manager review and recommend to the SAA point of contact re–allocation or de–obligation of funds based on sub–grantee performance in meeting identified timelines and objectives. • A summary of above reports are available to the Senior Advisory Committee for bi–annual review. DHS&EM will convene a multi–agency workgroup bi–annually prior to the Senior Advisory Committee meeting. This workgroup will assess the above listed reports. The Senior Advisory Committee will review the State Workgroup’s status report to assess progress. The committee will provide requests for additional information or clarification from DHS&EM. The Senior Advisory Committee will meet and discuss status of accomplishment of Strategy objectives. If one or more objectives may not be achieved, the committee will discuss options for resolution. The committee may determine additional assistance to the sub–grantees is necessary or an adjustment in State staffing as required, or a revision and amendment to the objectives as necessary to meet the overall goals of this Strategy. If a revision or amendment of the objectives is determined to be necessary the SAA will identify revised goals and objectives and report changes to the DHS NPD in the Biannual Strategy Implementation Report. This report will earmark those goals and objectives which have been revised and provide new supporting information regarding their measurements and assigned completion dates. Additionally, this report will also reflect successful achievement of Strategy objectives.